For deeper understanding of the subject, let’s divide it into two parts. Such seals were mostly personalized, i.e. initially they bore no family or hereditary meaning. Prints of some of such seals are preserved to this day. 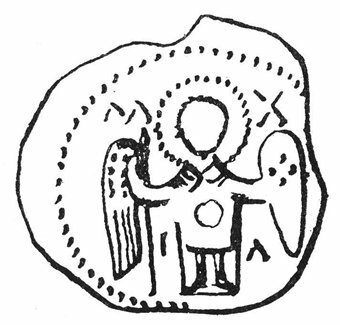 Some Kievan princes had seals with an image of Archangel Michael. 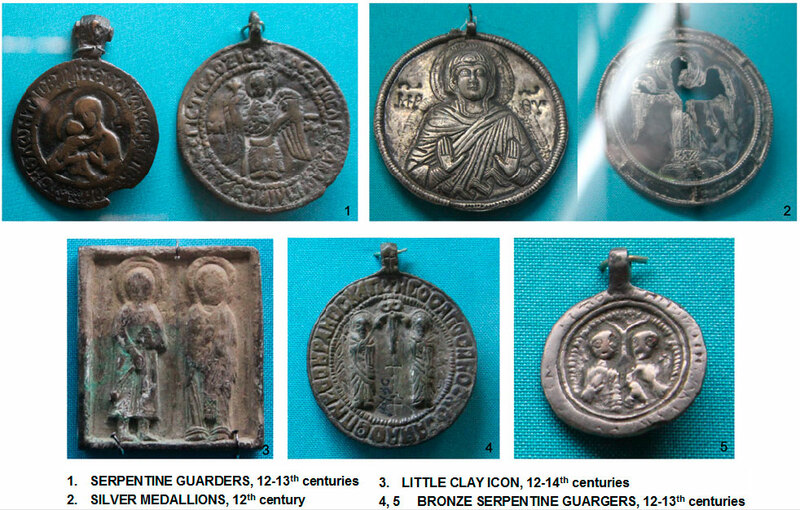 It should be mentioned princes used seals even before they ruled in Kiev, i.e. when they were only princes of various provinces, e.g. Novgorod, Polotsk or Chernigov. Perhaps, for this very reason the only 12-century seal preserved to our time and attached to the charter of Prince Mstislav Vladimirovich and his son Vsevolod (1125-1132) is now kept in Yuriev Monastery, Novrogod. 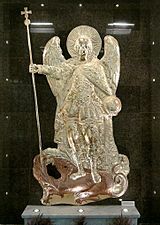 On one face of the silver gilded seal there is an image of Jesus Christ, while on the other one there is Archangel Michael striking a serpent. 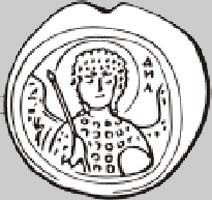 As we can see on extant samples of princes’ seals, the Archangel is depicted there with a spear. 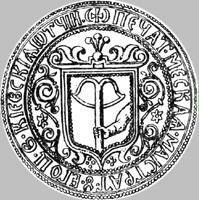 … In the Middle Ages, Christians chose symbols for their seals, which were adopted from the Saviour’s divine teaching and provided a certain guarantee that an order sealed with such a seal would be implicitly fulfilled. 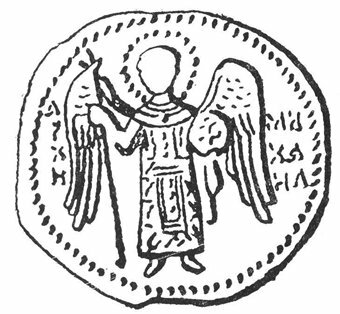 Yet, why was exactly Archangel Michael depicted on the seals? The thing is that some Kievan princes (4 to be more precise) were baptized under the name of Michael, and so they hoped for the support of their heavenly patron in all their earthly affairs including internecine wars with their own brothers for the right to rule in Kiev. Another way to “please” one’s heavenly patron was to build a church in his or her honour. 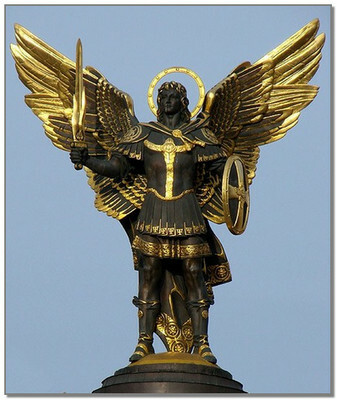 Therefore, some churches of that time known to us were dedicated to Archangel Michael. Which ones in particular? The most famous is the one which is currently called St. Michael’s Golden-Domed Monastery (Kiev), though initially it was St. Dmitry’s Monastery. 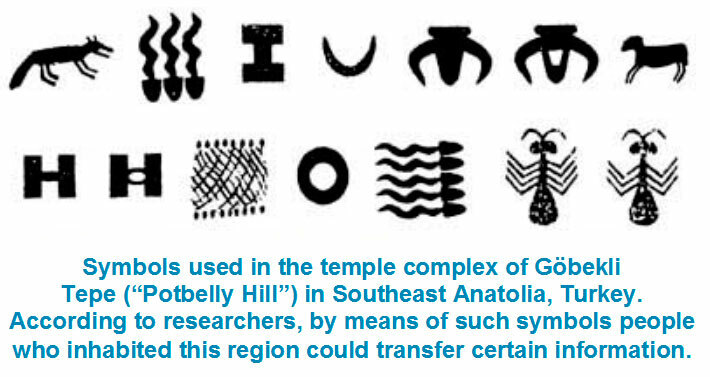 It is mentioned in the Hypatian Codex / Ipatiev Chronicle (11th century) and was established by Prince Izyaslav (baptized as Dmitry), the son of Yaroslav the Wise. The story of the monastery is quite typical for that time: internecine wars between princes, family traditions, and enormous arrogance. Later on, St. Dmitry’s Monastery turned into the prince’s family burial vault and there appeared another church dedicated to St. Peter, built by Izyaslav’s son Yaropolk (Peter). Still later in 1108, Izyaslav’s younger son Sviatopolk (Michael) constructed the legendary St. Michael’s Golden-Domed Monastery in the territory of St. Dmitry’s Monastery. With this prince numerous unpleasant stories are associated: he was called greedy and attached to earthly pleasures. Kiev Pechersk Patericon mentions how the prince oppressed Reverend Prokhor the Oracher. In the 12th century a severe fire occurred in Kiev, and St. Dmitry’s Monastery got burnt because all buildings were wooden, whereas St. Michaels’ Monastery was stone and escaped destruction. The first one was restored; but its name became St. Michael’s since then. It existed until 1937 when it was blown up by the order of Soviet authorities. It was restored again in 1997-1998. As we can see from the aforesaid, it was fashionable in Kievan Rus to build churches dedicated to one’s heavenly patron whose name was given to one pr another prince when he was baptized... Well, it was also an opportunity, of course, for princes to “outdo” their predecessors. Another example: in 1070 Kiev Prince Vsevolod Yaroslavich laid and built St. Michael’s Cathedral on the occasion of the birth of his son Rostislav who was baptized as Michael. Now this site is called St. Michael’s Vydubytsky Monastery. From geology standpoint the place chosen for the cathedral was too complex for construction – near a precipice, right above the DnieperRiver. Thus, already in the 12th century the cathedral eastern wall was regularly damaged by landslips. There were attempts to reinforce the bank, nonetheless in the 16th century a half of St. Michael’s Cathedral (its dome and entire sanctuary) fell down into the Dnieper along with the breast wall. The monastery was also used as a family burial vault. 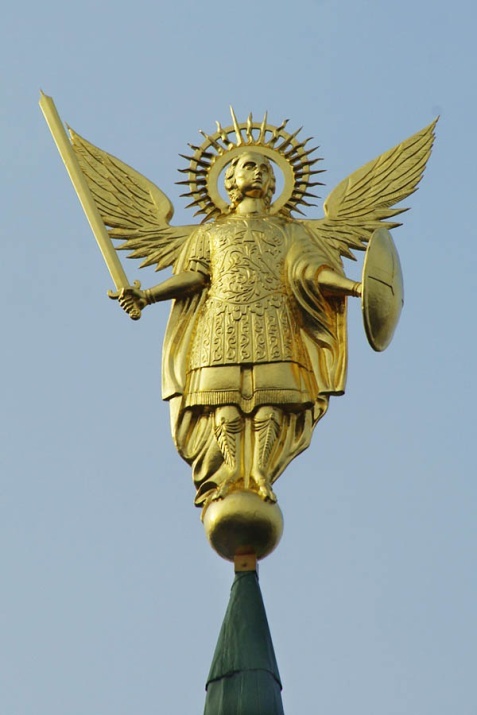 Drawing preliminary conclusions, we can say in the time of Ancient Rus Archangel Michael was the patron of princes of Kiev and other cities, taking into account that princes moved from one throne to another. 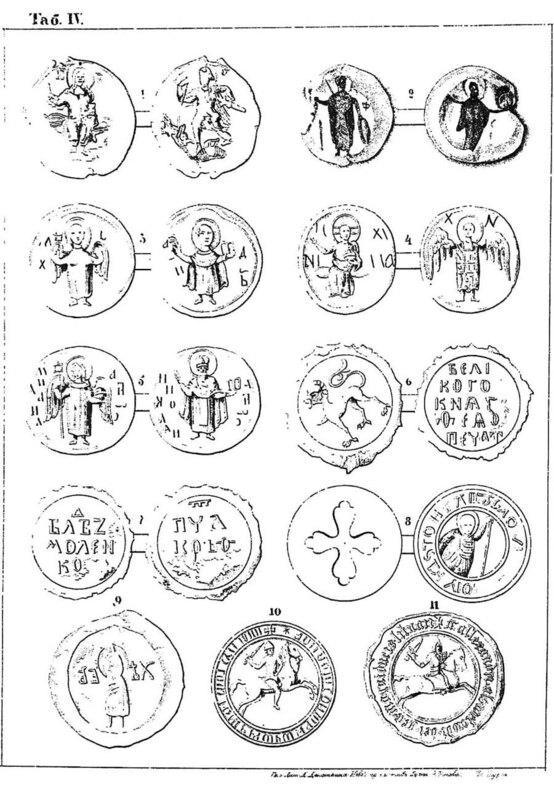 Hence, Michael was depicted on princes’ seals, and churches were dedicated to him. Princes endeavoured to gain their heavenly patron’s support in internecine wars which they often initiated against each other. However, a prince is not an entire nation, and so it’s inappropriate to regard Michael as the full-fledged patron of Kiev. In any case, he could not be depicted on the city coat of arms in those times, because Kiev had no coat of arms then at all. (Photo: a bas-relief in St. Vladimir’s Cathedral in Kiev depicts Andrey Bogolyubsky, the Great Prince of Vladimir. Archangel Michael is on his shield.) An unprecedented event in history is associated with this prince: in 1169, in the course of princes’ internecine wars, he became the organizer of a well-known campaign against Kiev and occupied the city. In his Essays on the History of Kiev Land M. Grushevsky wrote the following: “There had never been such a trouble in Rus before that fellow countrymen would ravage Kiev.” The Hypatian Codex contains details of the event: “…for two days the entire city, Podol and the Mount, monasteries, St. Sophia’s Cathedral and Church of the Tithes were being robbed, and nobody was shown mercy to. Churches were burning, Christians were murdered or taken prisoners, including women who were forcefully taken from their husbands, and babies cried looking at their mothers. Plenty of wealth was taken away, churches were left empty without icons, rizas and bells, and books were taken along. The invaders burned even the Pechersk Monastery of the Holy Mother of God, but Her prayers to God protected the cloister from ruin. Kiev was full of moaning, sorrow and inconsolable grief, and tears streamed endlessly. All that happened because of our sins.” Here’s what the princes were like! 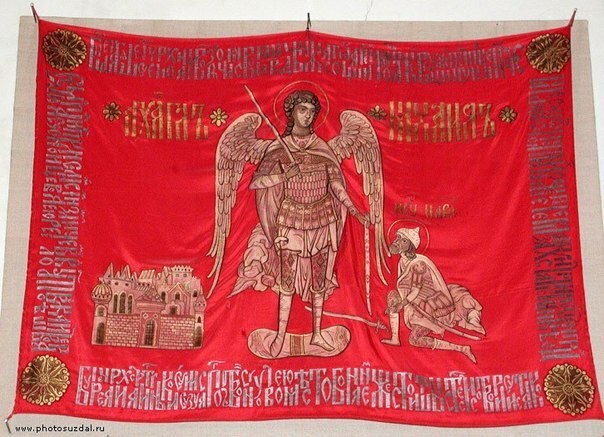 The tradition of getting support from the militant patron Archangel Michael, which tradition originated from Kievan princes, may be traced in later times as well. For instance, he was on the flag of Minin’s and Pozharsky’s corps (on the left) that liberated Moscow from the Poles in 1612. 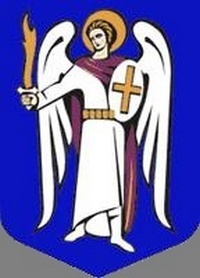 A similar image of Archangel Michael with a raised sword appeared, as we will see below, on the coat of arms of Kiev when the city became a part of the Russian Empire. The same image was also on gonfalons of the Army of Zaporozhye (on the right). 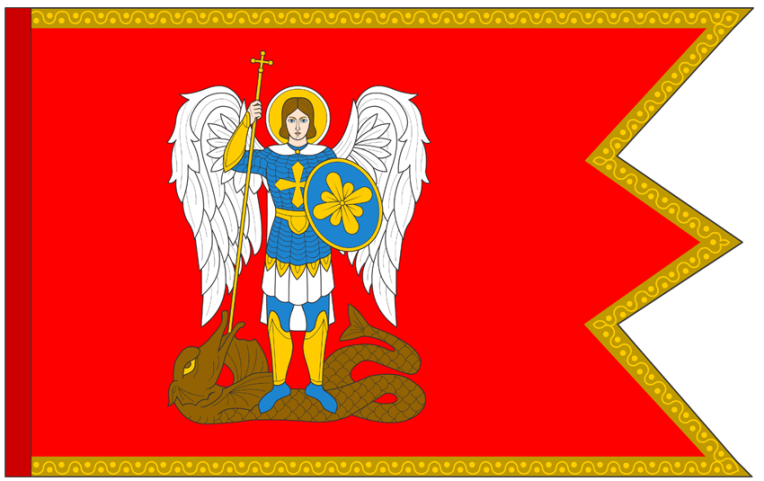 Here, the Archangel is depicted striking a serpent with a spear, like in the Kievan princes’ tradition. The history of the coat of arms of Kiev as such started in the late 15th century when Kiev became a part of the Great Lithuanian Princedom. In 1471 the Kiev Princedom was transformed into Kiev Voivodeship, the emblem of which (and not the city of Kiev!) was an angel holding a lowered sword in his right hand and a scabbard in his left hand, depicted on a red shield. 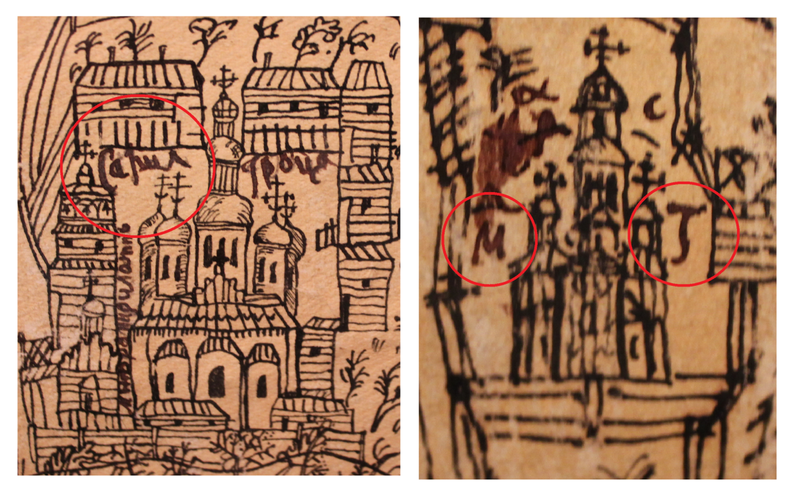 On a military gonfalon of the second half of the 15th century another Kiev emblem is found: an angel in a red field on the obverse and a bear in a white field on the reverse. This is exactly how the coat of arms of Kiev Voivodeship was depicted in the Polish Armorial by Kasper Niesiecki. 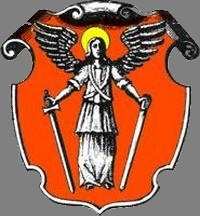 Around 1494-1497 the Magdeburg Rights were introduced in Kiev, and the city got a coat of arms similar to that of the Voivodeship: a white angel in a red field (according to Kiev researcher V.V. Rumyantseva who refers to Niesiecki’s Polish Armorial). 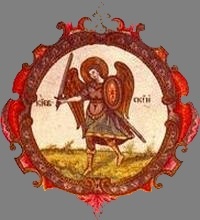 It should be mentioned that in pre-Russian heraldry Archangel Michael was usually associated with either Kiev Voivodeship or the Kiev regiment, while the coat of arms on the Magistrate seal was totally different. 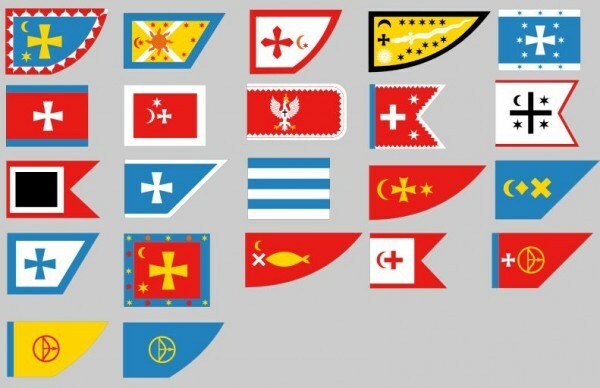 We can see the same symbol on gonfalons of some regiments of the Army of Zaporozhye (the last line). Let’s say a few words about the Magdeburg Rights that originated from Germany. Such new rules adopted from the West were interesting, first and foremost, for prosperous inhabitants of the city, princes, boyars, and later for rich landowners. Certainly, to establish the new order martial symbols were necessary, which in the people’s memory were associated with a strong power. It’s important to say the Rights were totally alien and inacceptable for ordinary people, for, although previously the Slavs had had powerful princes over them, major issues had been resolved by conscience in popular assemblies. Hence, the new order was imposed by force, provoking natural resistance of the local population. 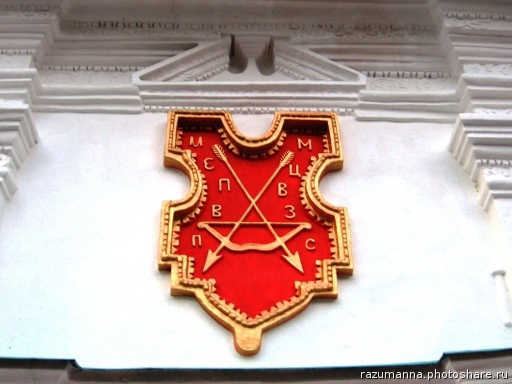 As we see, the image on the Kiev Magistrate seal (circa 1500) included a hand holding a bow with an arrow (by 1630 it was transformed into an arbalest). 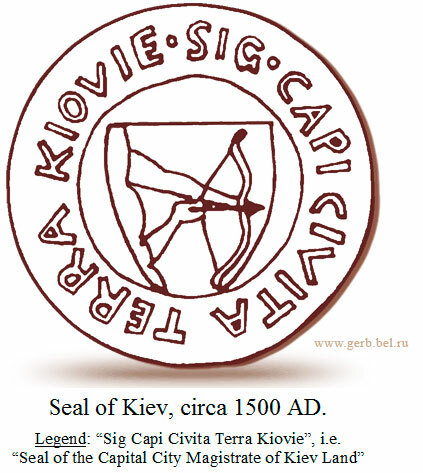 After Kiev became a part of the Russian Empire, the Magistrate seal with the arbalest was still used for a certain while, through with a different inscription: “SEAL OF HIS ROYAL MAJESTY’S CITY MAGISTRATE OF KIEV LAND”. (V.V. Rumyantseva. Emblems of Lands and Coats of Arms of the Cities of Left-Bank Ukraine in Feudalism Times). 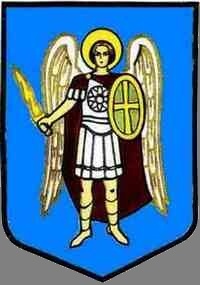 In 1672 Book of Titles the coat of arms of Kiev was first presented with an archangel holding a shield and a sword. 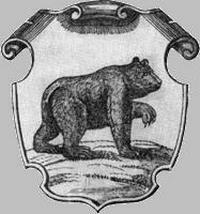 This very version of the coat of arms became official for Kiev in the Russian Empire. 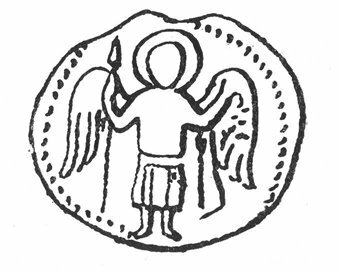 It is noteworthy that along with the Kiev Magistrate seal where a bow and later an arbalest were depicted the Magistrate building had an image of Archangel Michael on it. The building was situated in Podol district, near the current Square of Contracts. Magistrate building. 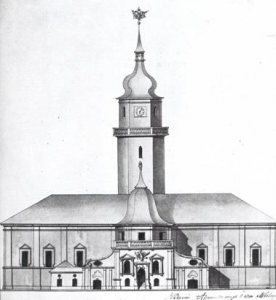 In 1697, an elegant stone tower was attached to the oblong main building. The tower was about 30 metres in height and had a spire with a double-headed eagle on its top. The building was ruined in the fire in 1811. High relief on the Magistrate building façade. It is now kept in the Kiev Museum. We can see Michael traditionally portrayed with a spear striking the serpent. Tsar Nicholas I decided to abolish the institution of city voyts and introduced the position of a city head, which was elective. Thus, in 1834 the power of Kiev Magistrate was abolished as well. 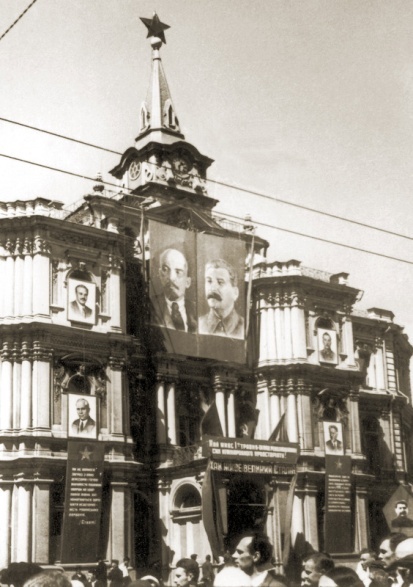 The Duma building was erected in 1876 in the place of contemporary Maidan Nezalezhnosti (“the Independence Square”). Initially it had two floors. 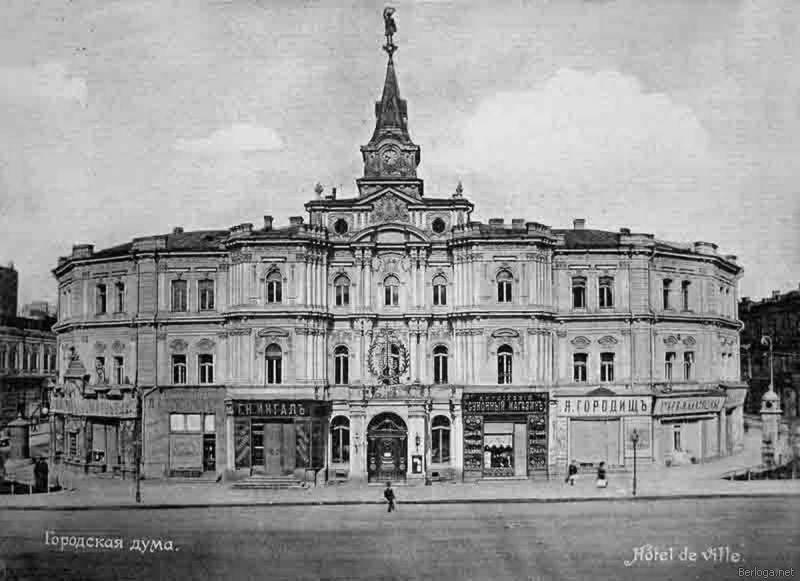 Once the building was erected, the square in front of it was named Dumskaya. In 1900, the third floor was attached to the building upon its reconstruction. The building was destroyed during the 2nd World War. On the top of the Duma building there was a spire with a sculpture of Michael who brandished a sword on a serpent. The sculpture had a tragic story: when Bolsheviks came to power they replaced Michael with a star. The sculpture itself was sent to a museum, but… it vanished without a trace. Most probably it was melted, for those were severe times. Source: V.V. Emblems of Lands and Coats of Arms of the Cities of Left-Bank Ukraine in Feudalism Times. 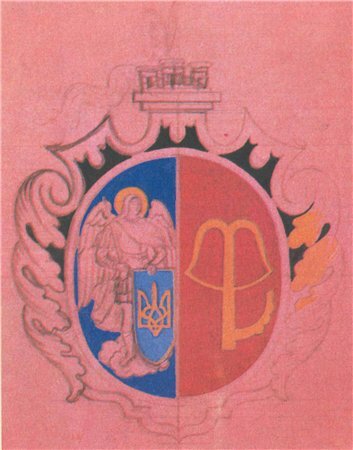 Sketch of the coat of arms of the Ukrainian People’s Republic (1918): was not approved. Here we see an attempt to combine two symbols. 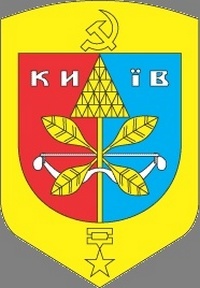 In 1969 the Soviet coat of arms of Kiev was adopted. The Archangel was rejected by ideological motives. The central image of the coat of arms was a chestnut leaf. On the shield there were also a bow, the initial seal symbol, and the hero city star. 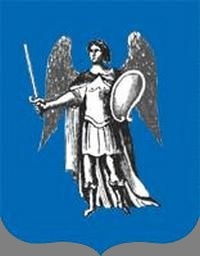 By its resolution No.57 of 18 April 1995, Kiev City Council restored the historical coat of arms of the time when Kiev was a part of the Russian Empire – the image of Archangel Michael against a blue shield in the background. In practice, various styles of the image are used. The Archangel may be portrayed either full face or in profile. He may wear either military clothes or a long shirt. This is a brief story of the coat of arms of Kiev. However, since Kiev has a very special attitude to Michael, a few words should be said about the Archangel’s sculpture on the main national square of Ukraine – Maidan Nezalezhnosti. The sculpture was installed on Maidan in front of the Central Post Office building in 1996, on a pillar made of Italian marble. 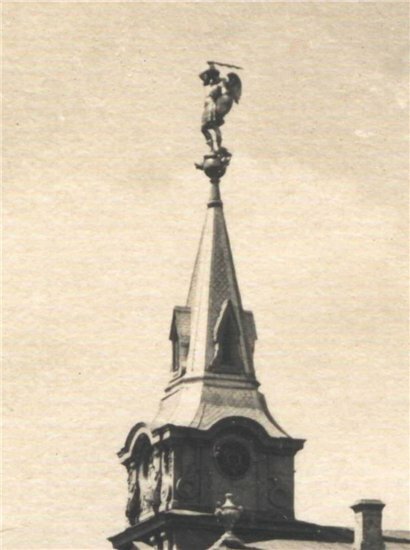 The place was selected, as mentioned above, because the Municipal Duma building was here in the 19th century with the Archangel on its spire. 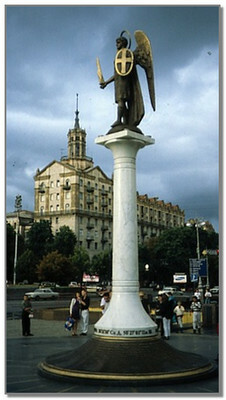 In 2001 the statue was taken away from the square, but later on brought back. When it was being installed, several people were injured by a stone that fell off the pedestal. After the accident they decided to present the sculpture to Donetsk and put a globe on the same pillar in Kiev. 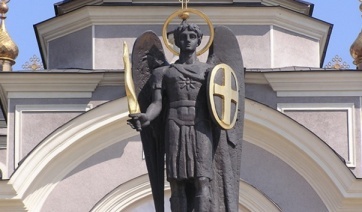 This is Archangel Michael standing in the place of his new “residence” – near the Saviour Transfiguration Cathedral in Donetsk. 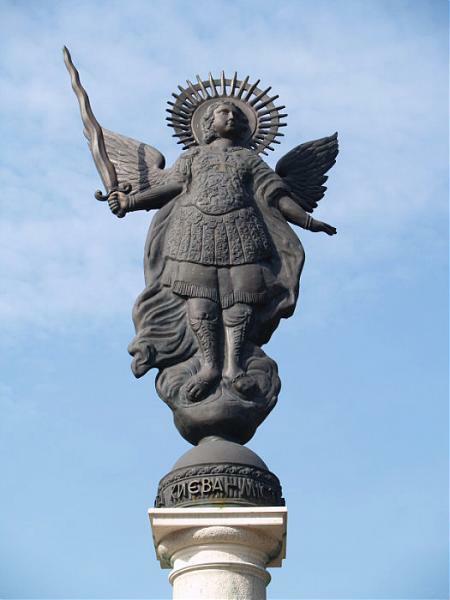 By the same “interesting” tradition Kiev made one more present – in 2004 the city gave another statue of Archangel Michael to Kharkov. It was installed in the city park. 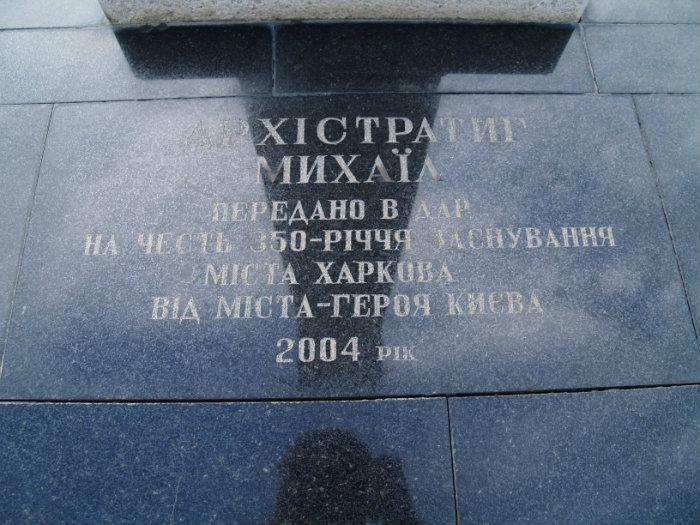 After Maidan reconstruction in 2001-2002 a new Ukrainian baroque statue of Archangel Michael was placed there. A year before – in 2000 a restored sculpture of Michael was installed on the portico of St. Michael’s Cathedral. As for the sculpture of “new” Michael placed on Maidan, it should be stated a major fuss arose in mass media right after the sculpture installation, for neither clergy nor Kiev residents liked it: the former noted the figure was not canonical, whereas the latter promptly nicknamed it as the “batman”. The sculpture was executed in baroque because the arch itself (the Lyadskie or later on Pechersk Gate) were built in the same style. The baroque style itself came to the Slavic lands from Western Europe. The Italian word bаrоссо originates from the Portuguese perola barroca – “an irregular-shaped pearl”, i.e. “a pearl with a defect”, meaning a defect in a precious stone, a deformed pearl. It’s noteworthy that since ancient times a pearl was a symbol of the soul. According to one of existing theories, all relevant words in European languages originate from the Latin bis-roca meaning “a twisted stone”. In different contexts the word bаrоссо could mean “fancifulness”, “affectation”, “insincerity”, “elitism”, “deformity”, or “exaggerated emotionality”. Dark and often disproportionate forms are a distinctive feature of this style. We can say it’s a very peculiar style, also called the “country style”. 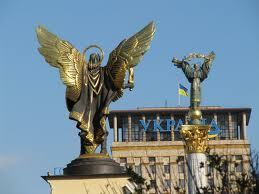 The baroque-styled Archangel on Maidan resembles a Roman soldier who threatens someone with his sword. Yet, whom does he threaten? If we look at him from the back, we arrive at bad associations: he as if threatens the Statue of Independence, which is also called Orans-Ukraine, standing on a single axis with him. It turns out we have a sort of a face-off, and Kiev residents admit this. In 2010 such statue was installed on the Southern Gate of St. Sophia’s Cathedral, though initially there was no statue there. It appeared in the 18th century only, when the cathedral underwent reconstruction that substantially changed its original appearance. The Ukrainian Family ICF dealt with the statue installation. 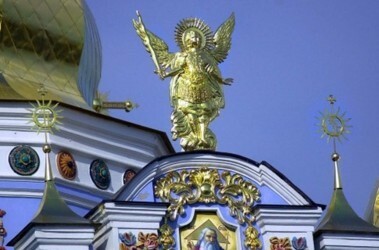 At that, a question arises: why in 2010, at St. Sophia’s Cathedral – one of the oldest architectural monuments in Ukraine and the UNESCO World Heritage Site – the sculpture of Michael was placed? After all, UNESCO regulations forbid not just any rebuilding or completion, i.e. architectural interferences, but even religious services at the site? What do we get as a result? Speaking of the image of Michael as an element of the city coat of arms, he appeared on it in the 17th century and became established in the 18th century only, when Kiev was a part of the Russian Empire. 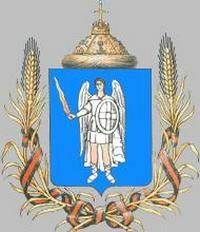 This very image is on the current coat of arms of the city. Michael is certainly the archangel and leader of the heavenly army, worshipped by the church, and he is probably dear to Kiev residents as a patron. 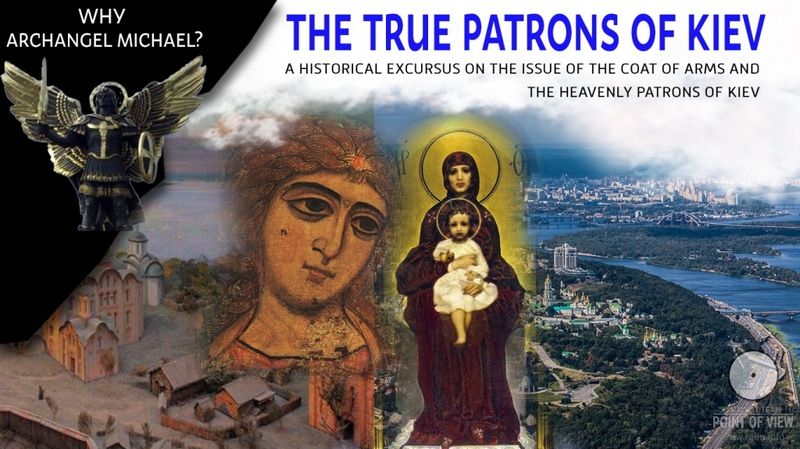 However, they mostly perceive him as the patron by a historical habit rather than consciously, for in view of the aforesaid, throughout the history, Kiev residents associated the Archangel’s figure, first and foremost, with the power of princes and later on with the city government, i.e. with the military and political aspect of life, not the spiritual, while the spiritual tradition is much broader, deeper and richer. 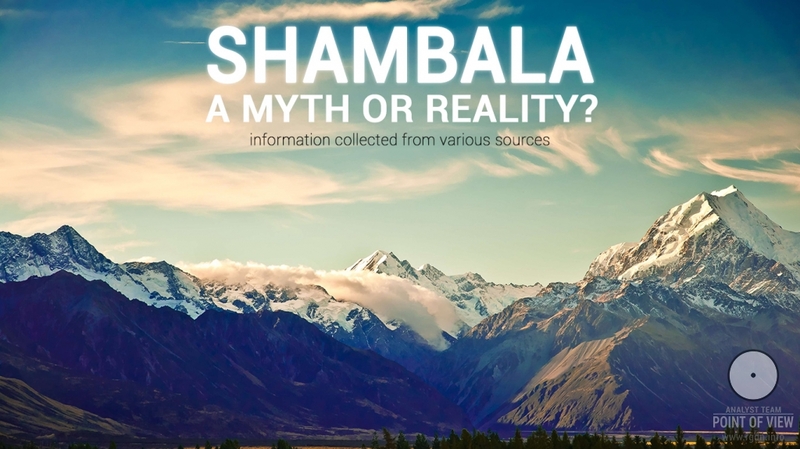 In other words, there is a substitution of concepts: the internal spiritual is replaced with the external (earthly), often with a militant emotional tinge. 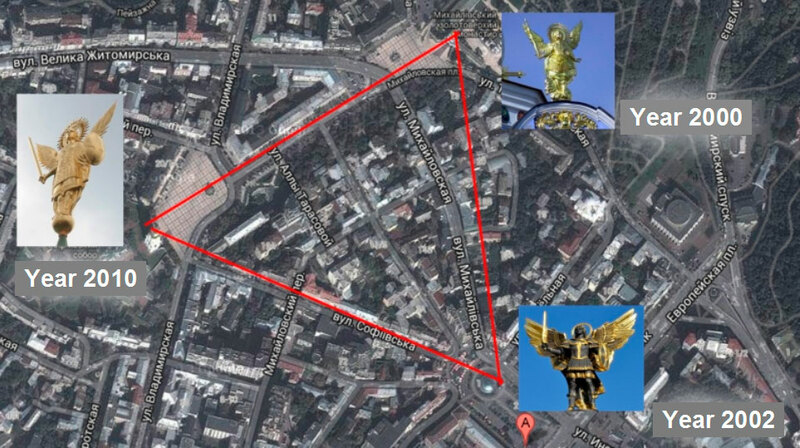 Should we analyse the city’s relations with Michael in the era of the independence of Ukraine and thoroughly compare all places and dates where the Archangel’s militant figure appeared with the events that took place in Kiev and the country, we will arrive at deplorable conclusions which should though be drawn by everyone on their own. 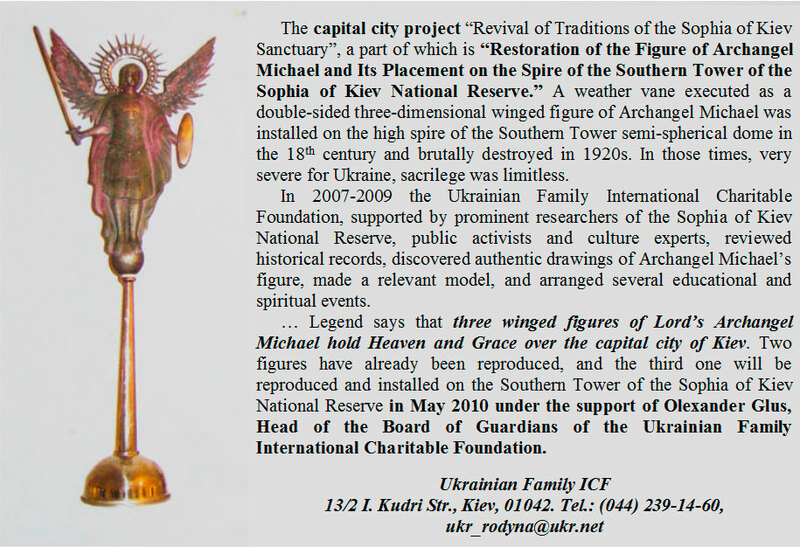 It is still a puzzle what Grace was meant in the Ukrainian Family’s note in the context of “revival of traditions of the Sophia of Kiev Sanctuary”, which was supposedly to manifest itself once three Archangels were installed, and what those mysterious traditions are, not known in history. As a matter of fact, totally other traditions are known! It should be stated in the very beginning that faithful believers have always known: the main patron of all cities is the Lord Himself, for “when the Lord restored the fortunes of Zion, we were like those who dreamed.” (Psalm 126:1). St. Andrew the First-Called, Christ’s close disciple, came to the hills where Kiev later on emerged, put a cross there and said to his followers: “See these hills? Upon these hills shall shine forth the beneficence of God, and there will be a great city here, and God shall raise up many churches.” (The Tale of Bygone Years) Thus the history of Kiev as of the Slavic spiritual centre started. 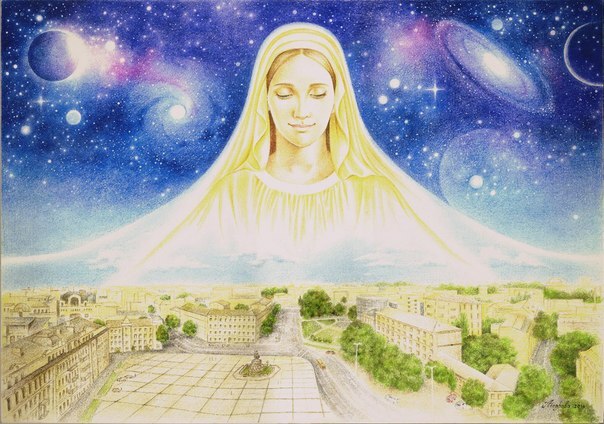 As for Kiev residents, they have traditionally had a special attitude to the Mother of God, Our Lady who embodies the feminine spiritual and creative principle. 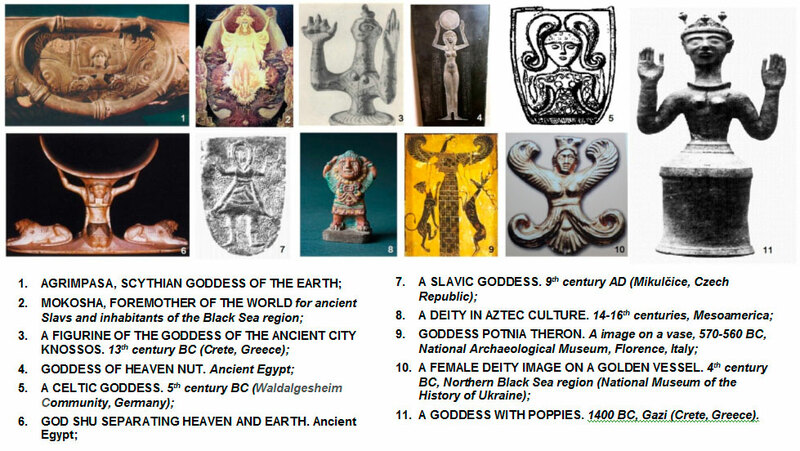 It should be mentioned the tradition of the Divine Feminine Principle worship dates back to remote past. Thus, as long ago as in the late Stone Age ancient peoples on different continents revered the feminine principle personified by the Great Goddess. 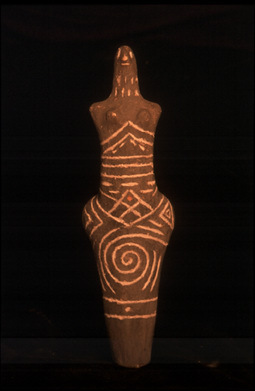 In the Slavic territories where the Cucuteni-Tripolye culture was spread (5-2 millennia BC), archaeologists find numerous figurines as those shown below. 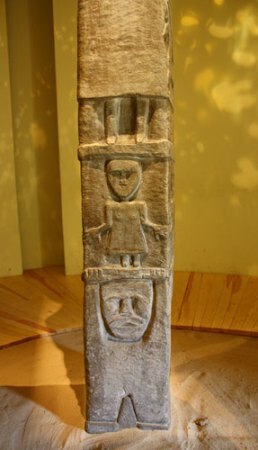 They are kept in a number of museums in Ukraine and other Slavic countries, and all such figurines apparently have a sacral meaning. 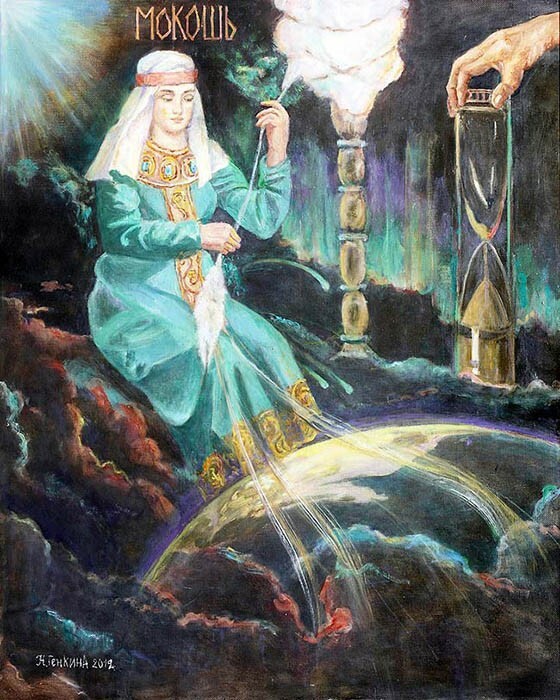 In pre-Christian times the Slavs particularly revered the goddess of the spring, harvest and love Lada and the goddess Makosh (Moksha, Makosha, Mokosh) spinning the thread of destiny. 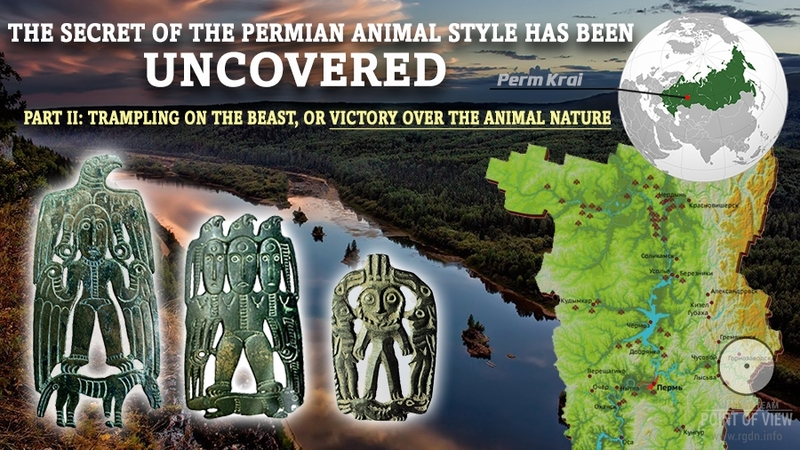 At that, there are grounds to believe the Slavs worshipped female and male deities jointly, which is evidenced, for example, by the Zbruch Idol discovered in 1848 on the side of ZbruchRiver. 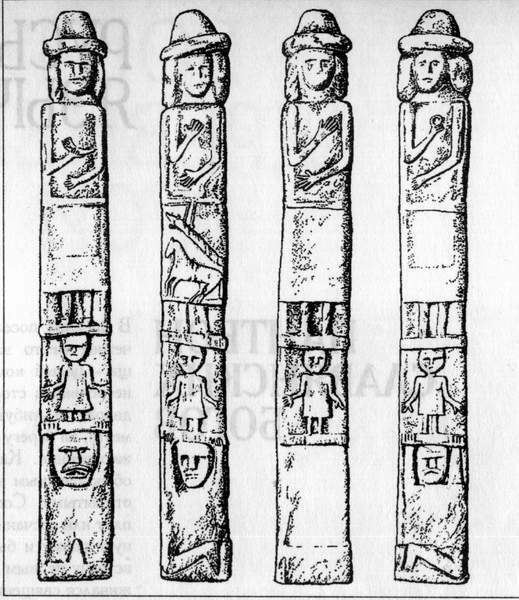 There, under a single hat there are four deities on the four sides – Makosh and Lada carved along with Perun and Dajdbog. (B.A. Rybakov. Ancient Slavonic heathenism) It’s a significant point which we will go back to later! 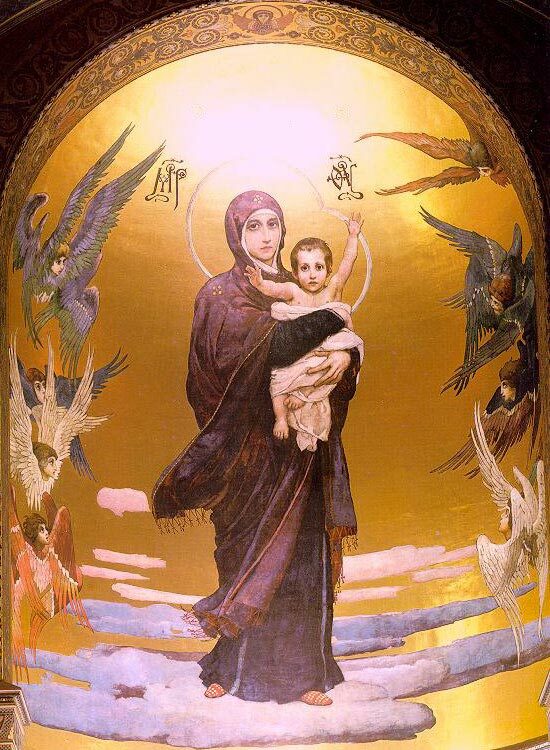 All the aforesaid supports an idea that the image of the Mother – Mother of God was very dear to the Slavs since ancient times, and it was worshiped even more than the image of Christ. 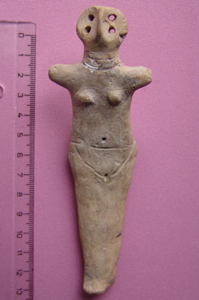 This is proved, among other things, by numerous medallions found by archaeologists in excavations. 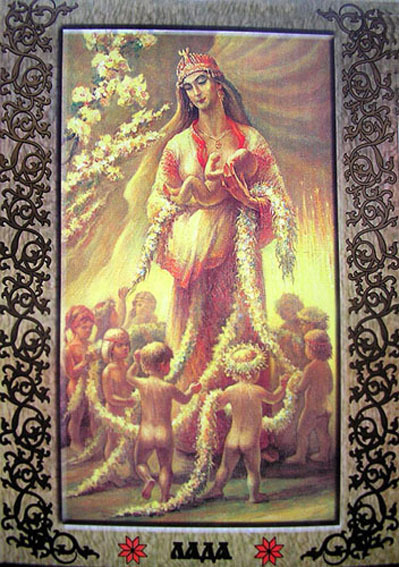 Kiev has a special long-standing relationship with the Mother of God as well. Prince Vladimir the Great laid a stone church dedicated to Our Lady – the Church of the Tithes. The Tale of Bygone Years says: “In the summer of 6497 (989 AD)… Vladimir decided to create a church in honour of the Most Holy Mother of God and invited the best masters from Greece.” The church name was due to the fact that the prince allocated one tenth of his income to its construction. Yet, why did Prince Vladimir decide to dedicate the church to the Mother of God? The thing is that when Vladimir was baptized in Korsun he was blind. He was baptized with an icon of the Mother of God brought by his wife Princess Anna. Once he emerged from the font, he saw the white light radiating from the icon, and thereafter he regained his eyesight. When he returned from Korsun, in order to express his gratitude he laid the church described above. As for the wonder-working icon of the Mother of God, it is now kept in Zimensky Assumption Monastery in Volyn Region, Ukraine. By the way, this monastery was also established by Prince Vladimir, as Nestor the Chronicler wrote in the late 11th century. After Vladimir’s death the Russian land was divided into two parts. The territory to the east of the DnieperRiver was ruled by Prince Mstislav, whereas the territory to the west was governed by Prince Yaroslav (called the Wise later on). 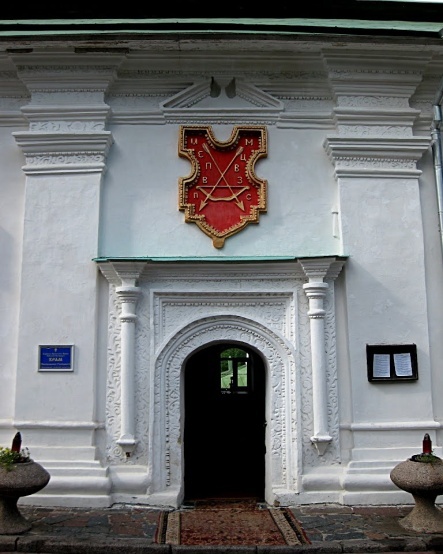 In 1022, by Mstislav’s order a church dedicated to Our Lady was built in Tmutarakan – the remote Russian colony in the area of contemporary Taman. As for Yaroslav, when he came to the Kiev throne he carried on his father’s deeds: his name is associated with construction of the main spiritual gem of Kievan Rus – the St. Sophia’s Cathedral. The last phrase was inscribed on the Church of Annunciation of the Most Holy Mother of God, which used to be located over the Golden Gate – the main gate leading to the city sacred space. The Hypatian Codex of 1037 contains a mention of the Church of Annunciation construction at the Golden Gate by Yaroslav the Wise for the purpose of “giving everlasting joy to the city from the Lord’s Holy Annunciation and the prayer of Our Blessed Lady and Archangel Gabriel” (Full Collection of Russian Chronicles, St. Petersburg, 1846-1921, V. 2, page 139). Everyone who passed through the gate uttered the last part of the above phrase: “Rejoice, the glorious city, the Lord is with you!” The Church of Annunciation on the Golden Gate was on the same axis with St. Sophia’s Cathedral and the Church of the Tithes, while the Golden Gate itself was oriented at Mount Athos well-known as the Home of the Mother of God. As for St. Sophia’s Cathedral, which was supposedly built in 1037, it was full of sacral meaning and thus may be talked much about. The initial cathedral building was quite unusual in design: it was a five-nave cross-domed temple with 13 cupolas and a pyramidal composition. The word nave originates from the Latin navis – “a ship”. In architecture it signifies a building oblong part that resembles a ship. At that, in the St. Sophia Cathedral symbolic meaning it meant “a boat floating through time” and embodied the “spiritual ark” of Kievan Rus. The central figure of the cathedral main nave is Virgin Orans, or Oranta (the Unbreakable Wall). Should we be able to visit St. Sophia’s Cathedral in the 11th century, we would have been deeply impressed with the view. Every piece of smalt on the 6-metre mosaic image of Oranta was selected by colour and tint, while every row was laid at a certain angle. The window system in the cathedral gallery let the daylight inside by a certain scheme. The effect was such that the image of Orans became three-dimensional and as if luminous from inside. During divine services, warm air from burning candles was rippling and coming up, thus an impression arose that the Holy Virgin revived and descended from the heaven straight to people present in the cathedral. Unfortunately, after the cathedral reconstruction in the 18th century the harmony of its initial meaning was broken. 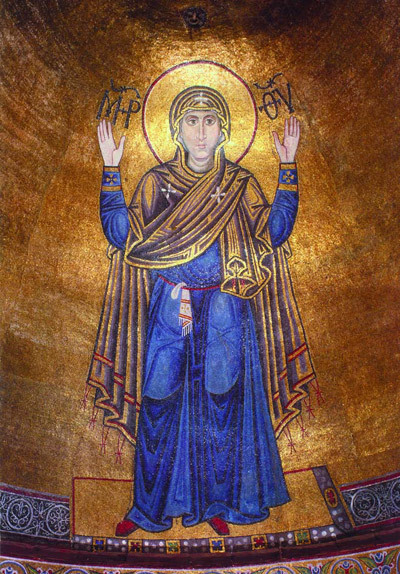 At that, on the semi-dome of the niche where Virgin Orans’ image is depicted there is still an extant inscription in Greek, made by Athos ascetics for the future generations of Kievan Rus: “Бог посреди ея и не подвижется:поможет ей Бог утро заутра” (“God is in the midst of her and shall not move: God help her morning by morning”). The next principal scene in the cathedral is the Annunciation. In religious art a thread signified human spiritual life, and in the global sense it was a symbol of time and connection between the past, present and future. It was a spiritual element uniting all living beings like a thread that joins together all pearls (souls). 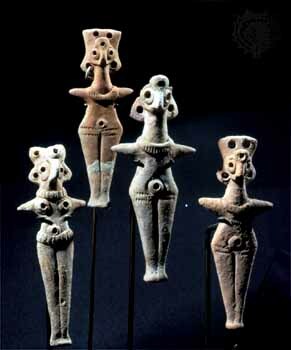 Many ancient peoples portrayed the Great Mother with a distaff in her hands, e.g. 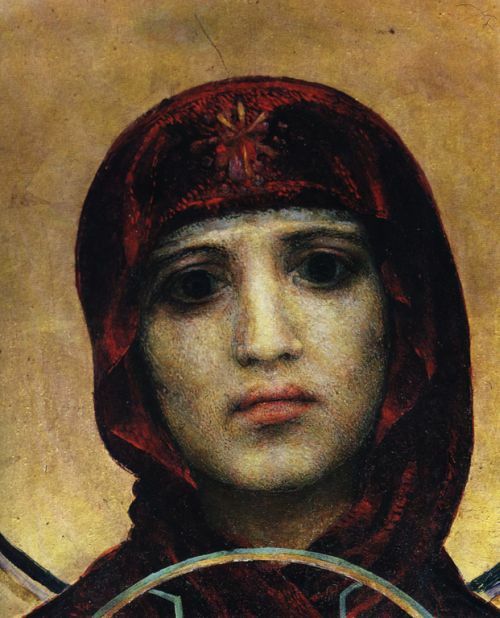 the Slavic goddess Makosh. 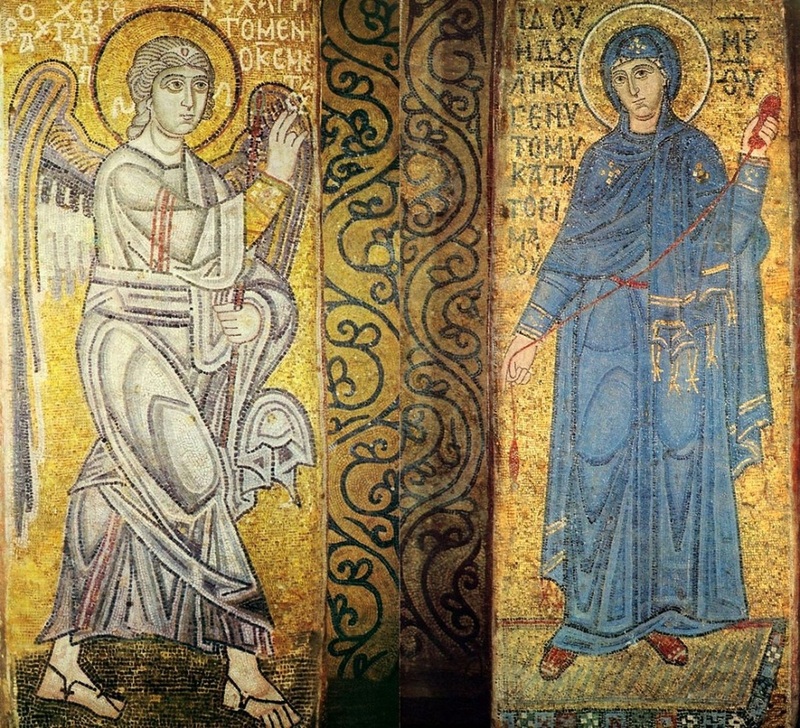 On the left image above (pictured from a pillar inside St. Sophia’s Cathedral) we can see Archangel Gabriel with the fingers of his right hand joined in a blessing gesture, while on another pillar (the image on the right) there is the Mother of God with a spindle in her hands, spinning the spiritual thread of human life. In the Old Slavonic language the word vereteno (spindle) originates from the word vertet (spin, vortex, spiral movement). The ancient Hindu word vartanam also means spinning, rotation. Since ancient times, in the spiritual context a spindle was considered a magic tool granted from above. In modern terms it’s a symbol of a prayer, meditation or spiritual practice. Spinning of threads by means of a spindle was a spiritual symbol known to many nations as the unity between Heaven and Earth, and unity between a human being in his or her fleeting earthly life and the spiritual heavenly principle (the Soul). By religious tradition, Archangel Gabriel was exactly the one who appeared to Virgin Mary when she was praying on the Mount of Olives to notify her of the coming Assumption. It’s worth noting that, just like in pre-Christian times when male and female deities had been revered jointly, originally Virgin Mary and Archangel Gabriel were worshipped together as well! Only in the 15th century they started to be revered separately, but people did know their genuine patrons and protectors. 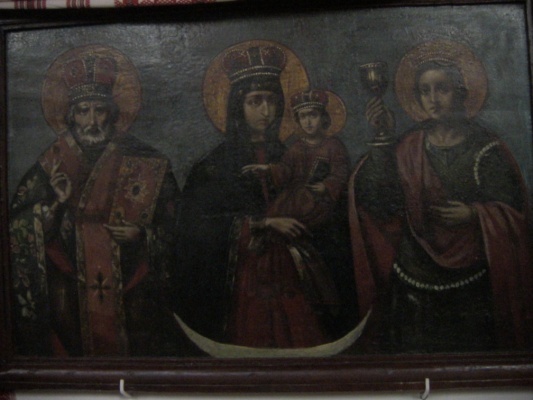 Hence, if we look at 1695 Kiev Layout (kept in the KievHistoryMuseum) we will see numerous churches dedicated to Archangel Gabriel and Virgin Mary. At that, it’s quite interesting to discover how Prince Yaroslav got such a great scope of sacral knowledge. Books by Anastasia Novykh contain some details of the story. It turns out the prince received the knowledge from an extraordinary person with a Greek name of Agapit, who later on became famous as Reverend Agapit of Pechersk. People also called him the Lord’s Physician or the Unmercenary Physician, because he healed with his prayers and never accepted any fee for that, regardless of his patient’s position or social status. Agapit was not just a true saint of the Russian land, but a thoroughly educated personality, too. Prince Yaroslav was among his regular patients, and they certainly communicated a lot. Owing to such close relations with Agapit, Prince Yaroslav underwent significant transformation as personality, having dramatically changed from a tough ruler who had brutally seized power in Kiev into a prince whom people eventually called the Wise. Diplomatic activities were maintained. Thus, no wonder that during the reign of Yaroslav the Wise Kievan Rus reached prosperity. It should be mentioned Virgin Mary, the Holy Mother of God occupies a special place in Kiev Pechersk Lavra as well. In 1073 the Assumption Cathedral was constructed as the main temple of Pechersk Monastery, but even before that time there already existed cave churches dedicated to the Mother of God. Still today, the relics of Reverend Agapit of Pechersk are kept in a shrine located in the Church of Presentation of the Most Holy Mother of God in the Temple in the Near (Antony’s) Caves of Kiev Pechersk Lavra. Another important point: after the construction of St. Sophia’s Cathedral in Kiev Prince Yaroslav initiated construction of St. Sophia’s Cathedrals as main temples in Novgorod (1046) and Polotsk (1040-1060). These cathedrals were based on a single idea; therefore architectural designs were almost identical. 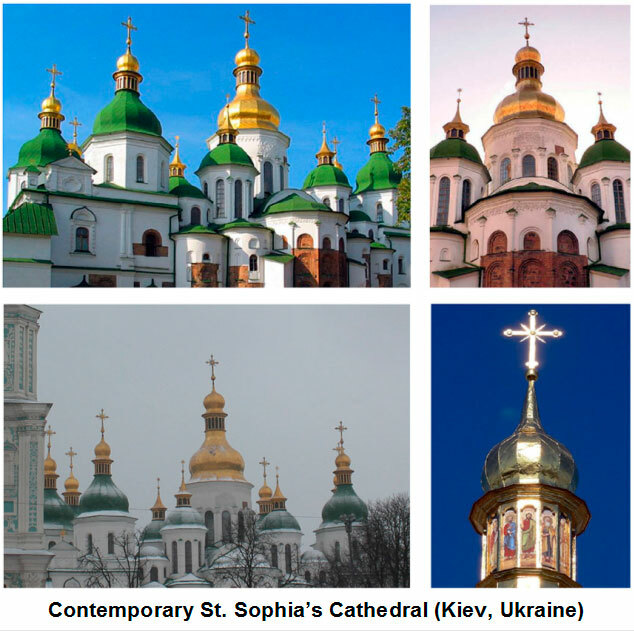 Unfortunately, all these temples including the main one in Kiev underwent architectural changes that broke the initial harmony. 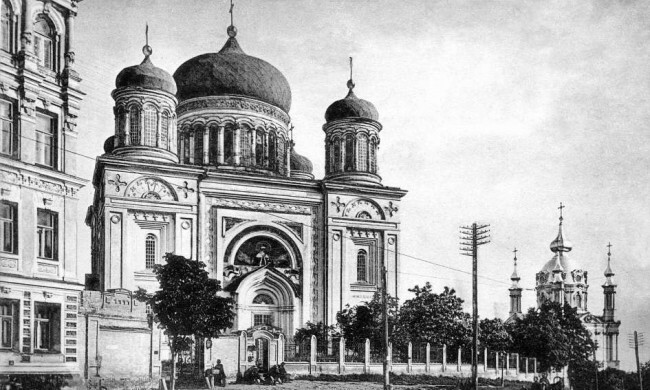 A century later – in 1131-1135 – a Church of the Assumption of the Most Holy Mother of God, also called the VirginPyrogoschaChurch, was erected in Podol (Kiev). In 1156-1160 Prince Mstivlav Izyaslavich built the main temple of Vladimir-Volynsky Princedom – the Assumption Cathedral, and in 1186 the Assumption Cathedral was laid in Vladimir as the main temple of Vladimir-Suzdal Princedom. 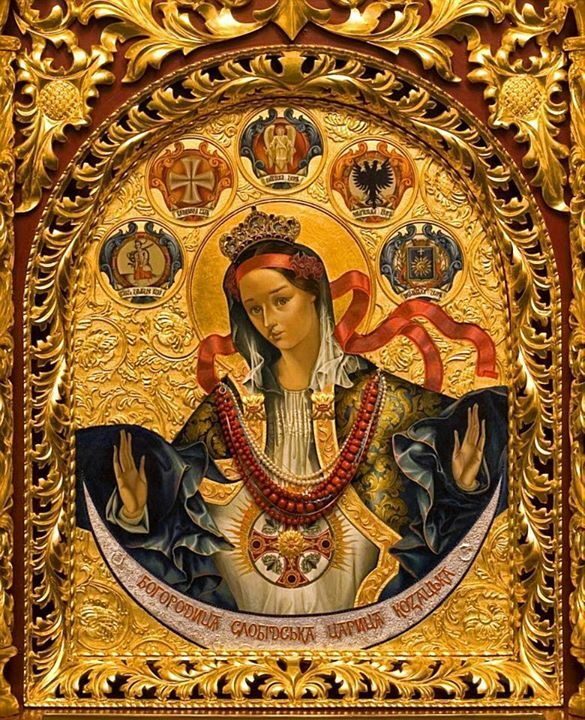 Another fact illustrating particular reverence of the Holy Mother of God in Kiev is that in churches dedicated to other saints the images of the Mother of God often occupied a core place, and we can see this even today. 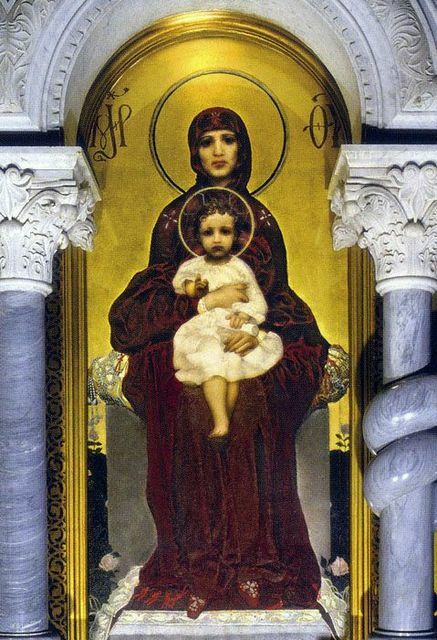 Above you can see an incredible image of the Mother of God with baby Christ, depicted on the iconostasis of St. Cyril’s Church. It’s the painting by Mikhail Vrubel. To continue, in St. Michael’s Cathedral of Vydubytsky Monastery which we have told about earlier Virgin Mary was apparently the core image, too. As we know, a part of the cathedral fell into the Dnieper, but it’s also known that in the mid 17th century the tumbledown temple was restored owing to funds of the Metropolitan Bishop Petro Mohyla who ensured restitution of Vydubytsky Monastery from the Uniate Church in 1630s. Two extant vaults divided the cathedral interior into two floors. In the lower part there was St. Michael’s altar, and in the upper part there was an altar dedicated to the Holy Annunciation. 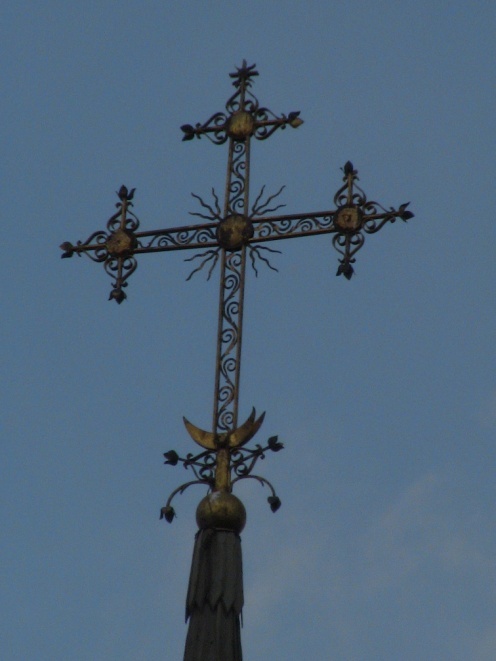 Finally, there is another important point to be elucidated – the shape of crosses on church domes. 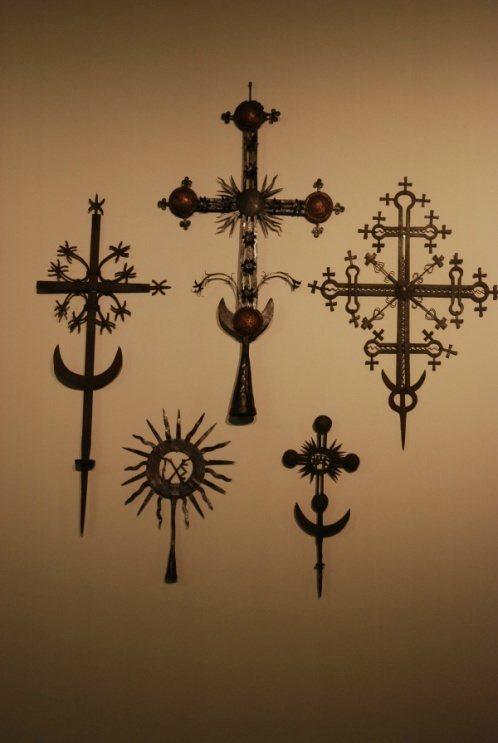 Initially on all churches dedicated to Virgin Mary, and not only to her, there were crosses of a certain shape, namely with an up-horned crescent at the cross base. 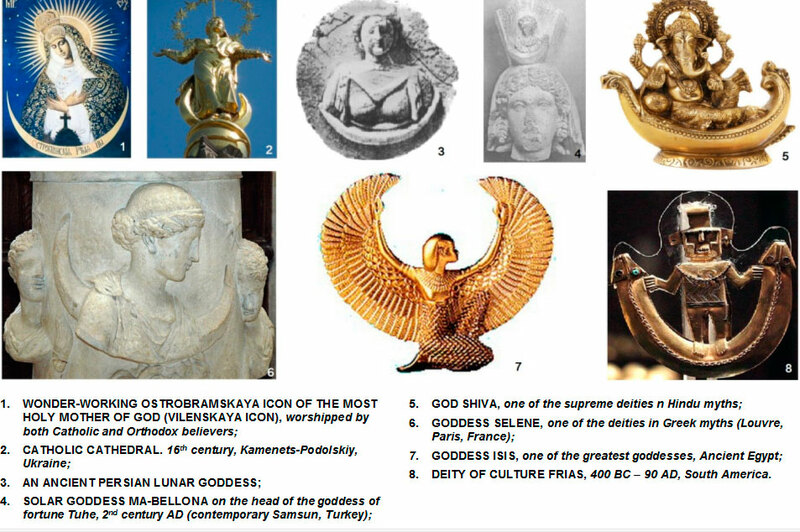 The crescent sign is a very ancient emblem of female deities. As of today, the most ancient artefact with the sign dates back over 12 thousand years. 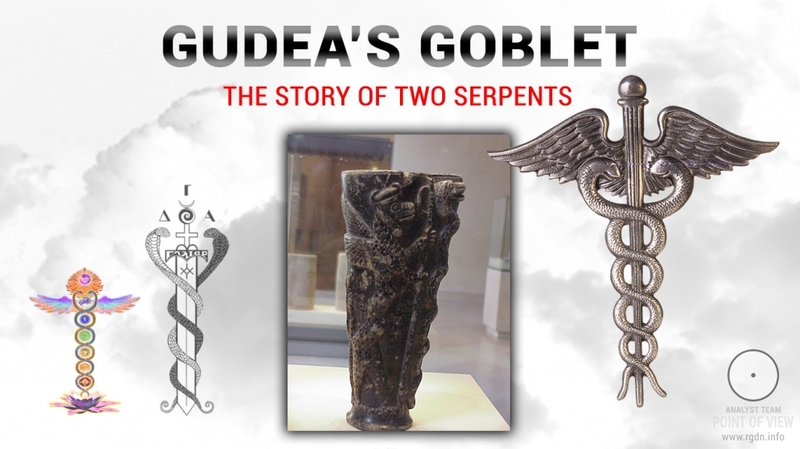 It was discovered in Göbekli Tepe temple complex in Southeast Turkey. It sounds a lot like description of the Ostrobramskaya Icon of the Most Holy Mother of God (Vilenskaya Icon) – item 1 in the above chart. Icon of the Mother of God with a crescent, the Ukrainian baroque style. The icon is kept in the Refectory Church of St. Michael’s Golden-Domed Monastery. The church construction was funded by Hetman Ivan Mazepa. It has remained until today. This cross with a crescent is on the same church. There are very few crosses with crescents on churches today. 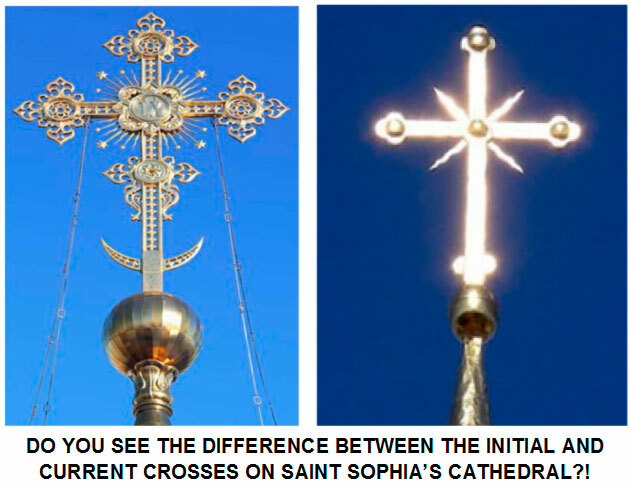 Since the 18th century such crosses began to disappear from church domes, being replaced with ordinary crosses with no crescent. 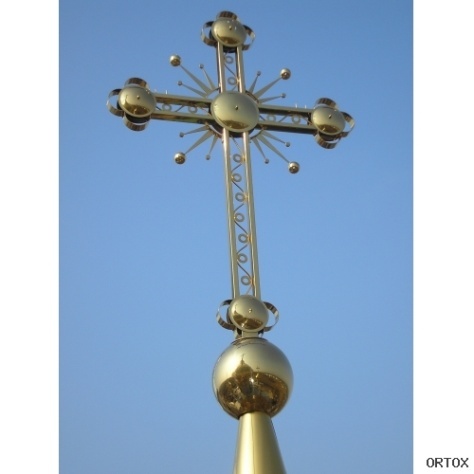 This is how crosses on church domes looked in the past. 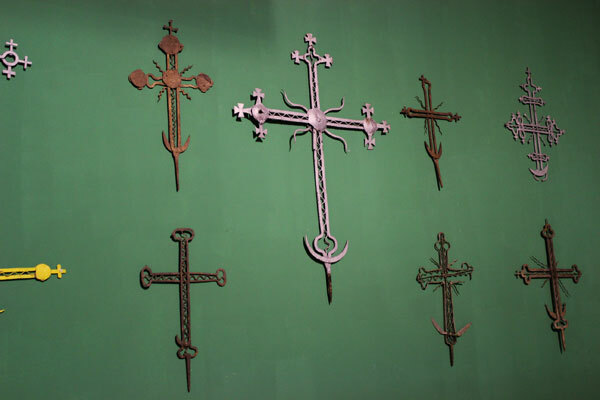 In the above photos you can see crosses of the 17th – early 18th centuries. 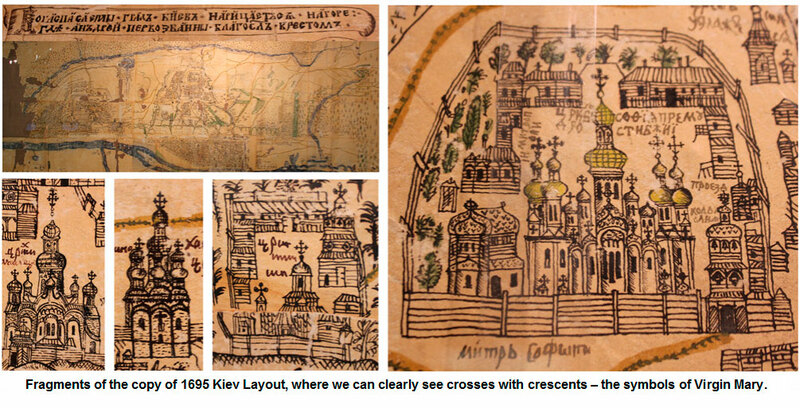 The same happened to St. Sophia’s Cathedral: unlike today, initially it had crosses with crescents as we can clearly see on 1695 Kiev Layout below. So, which “forces” (let’s call them in such a way) were interested in and actively promoted all the aforesaid processes in the 18th century on replacement of the crosses? 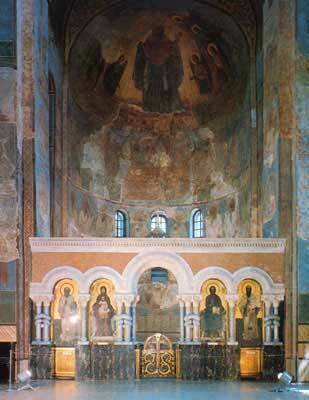 Who benefited from such a cardinal change of the original appearance of St. Sophia’s Cathedral? Who ensured placement of Michael with a sword on the cathedral Southern Gate, though he initially never was there? Who promoted and popularized this militant image in the society, substituting the concept of Kiev patrons, and for which purpose was this done? 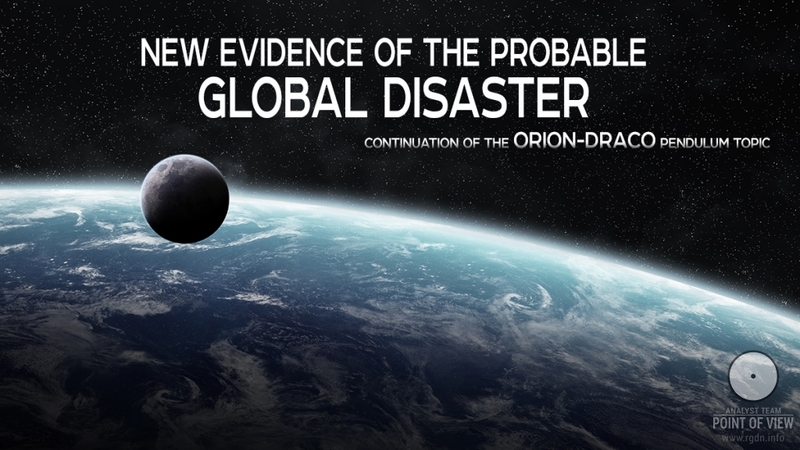 It’s difficult to find answers to these and many other questions. 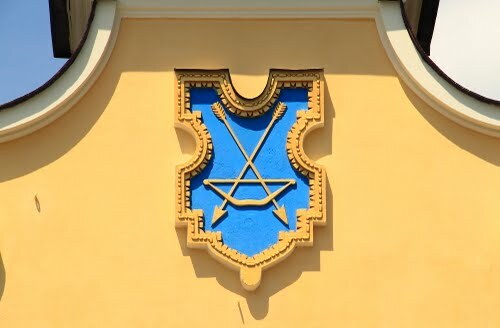 The only thing may be stated with confidence: since the 18th century in the Russian Empire Masonic lodges started becoming very active, penetrating into Russia from Western Europe (initially from Holland) in the times of Peter І. As a matter of fact, this tsar was exactly the founder of the first Russian lodges. Looking broader at worship traditions and digressing from Kiev, let’s mention that Zaporozhian Cossacks particularly revered exactly the Mother of God. 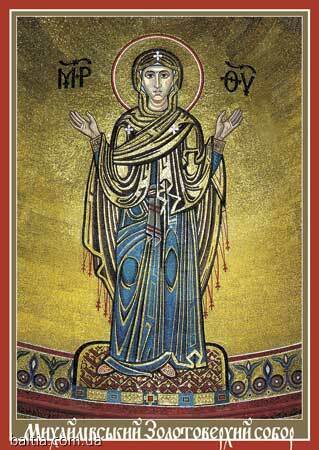 They regarded her as their protector and heavenly patroness, and dedicated many churches to her. For instance, a church on Khortytsia Island was dedicated to the Intercession of the Most Holy Mother of God, and the current Ukrainian Cossack Day is celebrated on 14 October – the feast of the Protecting Veil of the Mother of God. Even today the Holy Mother of God, Virgin Mary is the most revered spiritual symbol for ordinary people, because through her images she still helps those who call her for help. There are plenty of wonder-working icons of the Mother of God in many countries including Ukraine, by which people get comforted and healed. Moreover, there are numerous vivifying springs associated with Virgin Mary’s name and dozens of sacred places where she appeared to ordinary people and left traces of her sojourn on the ground, on stones or trees. She showed herself not only in churches and surely never selected to whom to appear depending on their social or financial status, but was seen to those who were pure in Heart. Hence, her glory on the earth is spreading and will further spread. This means if aggressive, militant symbols are established in society, people eventually perceive information coming from such symbols as a call to act, for the information goes directly into the subconscious, i.e. bypasses consciousness. In other words, the information is perceived without awareness, but it does get perceived! This provokes aggressive emotional moods in the society, and one who seeks war always finds it. Yet, on the contrary, if positive, spiritual stimuli are established in the society, the result is totally different, as we’ve got convinced on the example of Prince Yaroslav. Perhaps, the time has come to think of these issues seriously and responsibly! After all, EVERYONE HAS TO MAKE THEIR CHOICE!! !